While I haven’t found his more recent books quite as funny as his earlier ones, there is no denying that David Sedaris is still incredibly popular with the American book buying public. His latest literary outing, Squirrel Seeks Chipmunk: A Modest Bestiary, a collection of macabre animal fables, debuted in the No. 5 spot on the NY Times Hardcover Fiction Bestseller list and currently occupies the No. 1 spot on the Amazon.com Literature & Fiction-> Short Stories and Humor->Essays bestseller lists. David is currently in the midst of a book tour to promote Squirrel and he’ll be appearing at the world famous Apollo Theatre in Harlem on Nov 1 and 2 (Buy Tickets), and then again a week later at Barnes & Noble Union Square on Nov 8. 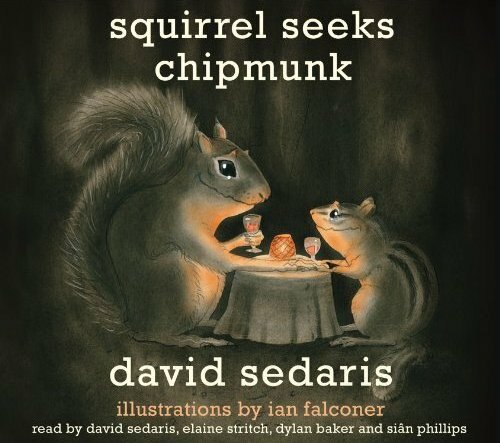 If you’d like to win an audiobook copy of Squirrel Seeks Chipmunk by David Sedaris, then all you have to do is follow me on Twitter (@bumpershine) and Tweet something like: “RT This and Follow @bumpershine to Win a Copy of “Squirrel Seeks Chipmunk” by David Sedaris http://bit.ly/aZuzbj” Only people who follow me are eligible to win, contest ends on Wednesday, October 20 at 11:59 PM, US entrants only please. You can enter this contest multiple times, but please try to keep your tweets to just once a day, otherwise it gets kind of annoying. Also, if you can correctly guess how many Twitter followers I will have at the end of contest, I’ll send you some random CD, DVD or pair of concert tickets (I really will, just ask uvears). Feel free to make your best guess in the comments or on Twitter. Also competing for your holiday dollar, is David’s sister Amy Sedaris, who has a little book of her own entitled Simple Times: Crafts for Poor People coming out on November 2. Amy will be kicking off her book tour at Barnes and Noble Union Square on November 4 and then wrapping it up about month later at Borders Columbus Circle on December 2. Before all that happens though, Amy will be a guest on The Sound of Young America Live at WNYC’s Greene Space with America’s Radio Sweetheart, Jesse Thorn (as some of you may recall, they both share a fondness for stuffed squirrels). Also on the bill for that show are: Judah Friedlander, John Hodgman, Baratunde Thurston and Les Savy Fav (Buy Tickets). More Amy Sedaris book tour dates after the jump.